Two interesting books were released some time ago. They are interesting for me in a reason that they have been released after my cooperation with those publishers was ended. Material inside includes my color profiles and they are regularly used as we make deal about. 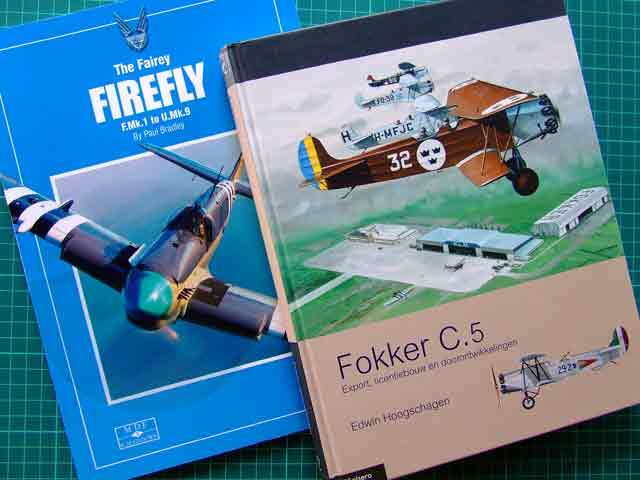 One book is Fairey Firefly from SAM Publications and the other one is Fokker C. 5 from Lanasta. Both tittles are interesting to mention. Paul Bradley is author of the Firefly and it is good book, it greatly covers all aspects of the development and operational use of this plane, with chapters with my color profiles. Sad to note that this book has no technical drawings sections, well known feature of this series of books. Edwin Hoogschages is the author of the C. 5 book and this is a continuation of the first title, in this one is covered all export machines. With just some over 30 years, Edwin is among the top researchers in the world and this book brings his brutal powers of research, study and subject analyzation. My color profiles were dispersed everywhere inside in the book and I must say that Edwin and I had a hard time to make correct specification of each type of C. 5 and according to available data, release correct color profile. With the type of subjects done inside, these two subjects are with no doubt my references work and they give brand new info on the subjects. I am grateful for cooperation with Paul and Edwin and wish them both good luck in life and many more titles to come. This entry was tagged art, aviation, Bradic, Srecko. Bookmark the permalink. I am interested to make an order for this Fokker C5 – book. Price?